The black-and-white images from the 1960s immediately evoke an era of experimentation and ebullience on the art scene: Andy Warhol clutching a bouquet at a gallery opening; Yayoi Kusama lying on a sculptural love seat at the height of her first American fame; naked women covered in blue paint rolling on paper to create an image for Yves Klein, while musicians play in the background. These photographs are among the highlights in an enormous trove of more than 200,000 prints, negatives and other photographic material that the Roy Lichtenstein Foundation is donating to five top art institutions. The gift, which the foundation will announce on Thursday, documents some of the art world’s most influential — and ephemeral — artistic achievements of the mid-20th century. The gift of the Harry Shunk and Shunk-Kender Photography Collection, estimated to be worth around $25 million, is being split among the Getty Research Institute in Los Angeles; the Museum of Modern Art in New York; the National Gallery of Art in Washington; the Tate in Britain; and the Pompidou Center in Paris. The photographs were shot by two eccentric characters, Harry Shunk and Janos Kender, largely from 1958 to 1973, and they capture an indelible era centered on the avant-garde world in New York and Paris. Art was often made communally, and spontaneously, and those the photographers caught in the act of creating it include Robert Rauschenberg, Merce Cunningham, Eva Hesse, Alexander Calder, Man Ray, Christo and Jeanne-Claude, and some 400 other artists. The German-born Shunk (1924-2006) and the Hungarian-born Kender (1937-2009) were hired as a team by artists and dealers to record events from routine gallery openings to major conceptual happenings. They shot on the fly and frequently at the same time, never identifying photos as by one or the other. The collection’s spirit — recording art making that looked a lot like play — is epitomized by Shunk-Kender’s 1961 image of a gun-toting and paint-splattered Niki de Saint Phalle taking aim for one of her “rifle-shot” works, in which fractured bags of paint created the image. Roxana Marcoci, senior curator of photography at the Museum of Modern Art, called the Shunk-Kender images “an extraordinary, absolutely amazing archive.” MoMA has already received 638 vintage prints; among the most valuable of those is a near-complete set of images from a 1971 performance project on Pier 18. Among the works: the artist Vito Acconci, blindfolded, being led to the edge of the pier, and William Wegman’s contribution, a bowling ball rolling toward pins. They collaborated with Yves Klein on “Leap Into the Void” (1960), a photomontage of him doing a swan dive. When the two photographers parted ways, in 1973, Kender gave Shunk control of the material they worked on together, and Shunk continued photographing for another 30 years; some of his solo work is also included in the gift. For years, the entire archive was moldering in Shunk’s hoarder-style West Village apartment in the Westbeth artists’ housing complex, directly across the street from the Lichtenstein Foundation. Toward the end of Shunk’s life, foundation staff members were aware that he was a neighbor, but they had no idea of the extent of his holdings. When Shunk died, in 2006, the photographs were carted off by the New York public administrator, and the estate was appraised. Dorothy Lichtenstein, widow of Roy and the foundation’s president, and Jack Cowart, its executive director, discovered its existence from the appraiser, with whom they had worked before. They stepped in and made a bid at the public auction, thinking they would be outbid by a museum. “We hoped to be Plan B,” Mr. Cowart said, adding that it was important that the archive not be dispersed. Once acquired (the foundation made later, much smaller purchases of Shunk-Kender images from other sources), it became a consuming project to organize and whip the material into shape. The foundation also created a free online archive. Glenn Phillips, acting head of the department of architecture and contemporary art at the Getty Research Institute, said, “This archival sharing is not so common, but the Shunk archive is the perfect candidate to try something like that.” The Getty is receiving the bulk of the gift, some 183,000 items, as well as management of the copyright on all the images, because of its ability to care for huge amounts of archival material. The Pompidou Center will receive 10,000 prints, and the Tate’s final number has yet to be worked out. The Lichtenstein Foundation intends to have an entire set of the most important images available in Europe split between the two museums, so that scholars and curators there will have easy access. Shunk’s disorganized archive was almost lost to history when the foundation rescued it in 2008, despite the minimal presence of Roy Lichtenstein in the reams of photographs. The acquisition and donation were the brainchild of Mr. Cowart — and of Ms. Lichtenstein, who personally donated $2 million to acquire the works. The foundation will hold on to some 25,000 Shunk-Kender works after the distribution and said it is likely to make more gifts. An earlier version of a picture caption with this article misstated the surname of the artist featured in the image. 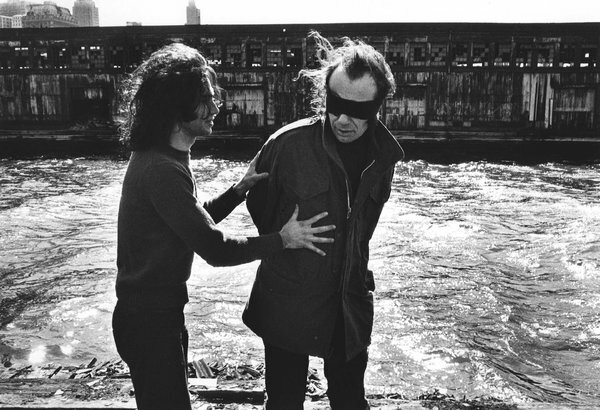 He is Vito Acconci, not Annonci.